I was standing in line at the local Teeters and saw a young girl wearing a cool, multi-colored, crochet beanie. I hoped I wasn’t worrying her mom too much as I peered over at her daughter to examine how her hat was made…4 simple granny squares around the head with one in the middle, and an edging. 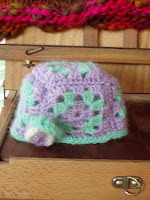 I came home to my stash and played around with this oh-so-cute hat… one for a toddler and one for a baby. I embellished them both with flowers and used soft mohair-like yarns. They will be given to our Stitches of Love group at Sedge Garden United Methodist Church. I absolutely love this group! A bunch of great ladies giving of their time and talents to help various ministries and service groups…pillowcases for breast cancer patients, aprons for hospice, prayer shawls for those facing surgery or long-term illness, baby blankets for newborns in their church, and hats for cancer services. I love having a reason to make hats. 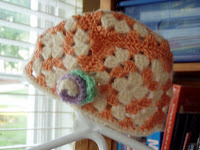 I don’t wear hats often, nor do many I know need one, but I enjoy knitting and crocheting them…especially for children! The only difficulty is that my 5 year old wants one for herself of every kind I make:) She is working on making little premie hats on a knitting loom–the ladies at Stitches of Love taught her how!